Yes, an 11 word answer (including the word ‘Dave’). Not so big on the details part really. I especially like the bit at the end were he makes a pleading face towards what I assume to be the producer. The look basically says ‘quick let’s move on, there is no way I’m digging into this one’. I asked the question because I don’t think we have a very good understanding of how society and technology are influencing each other at the moment. Etienne Wenger uses the term ‘Vortex’ for this relationship which I quite like because it’s fast, chaotic and powerful. The opportunity to ask Sir Tim questions came via @BBCDigRev on Twitter. It’s part of an ‘open and collaborative documentary on the way the web is changing our lives’ http://www.bbc.co.uk/blogs/digitalrevolution/It will be interesting to see how much of the activity on their blog makes it onto the small screen. Learning technologists are obsessed with technology more than learning, which is why elearning will never make the mainstream. We are purveyors of the worst kind of spin: ‘This new thing will solve all your problems’. The speed of the change has left us with the mistaken belief that social change was somehow ‘created’ by the digital rather than simply played out on the canvas of the digital. People with educations have huge advantages over those with skills and always will. While these did lead to a lively discussion, I was still no clearer by the end as to how to describe post-digital as a concept. For many the term seems to imply a discarding of digital technologies as if they were no longer important. It also appears to promise some sort of new world order – which is not helpful. After the fringe session I was even more convinced that the post-digital was a useful concept but that we hadn’t found the right way of expressing it yet. 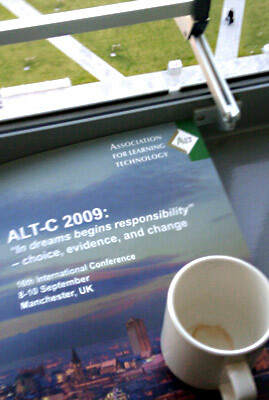 A couple of days later I gave my presentation at the ALT-C conference on my ‘Visitors & Residents’ principle. I had inserted a reference to the post-digital at the end of the talk to make the point that the Visitors & Residents idea rests on issues of motivation and personal preference rather than age or technical skill. This seemed to me to be a post-digital principle but, influenced by my conversations around the subject during the conference, I suggested that the term post-technical might be more appropriate.Ok so before I continue, yes this is a kind of semantic exercise, but what we have here I think is a strong idea which is difficult to express. One of the conclusions of the fringe sessions was that the rapid rate of change in technology is causing accelerated cultural effects which we are struggling to describe. (This was echoed in Michael Wesch’s keynote at the conference.) So I think it’s important to develop our thinking in this area even if it is a bit of a bumpy ride. Basic button-pressing, user-interface-comprehending activity is becoming culturally normalised and an ever-decreasing factor in our engagement with digital technologies (i.e. many of us are already digitally literate, if you will excuse the terminology). In effect our approach to technology need not be technical. A simple post-technical example: the substantive effects of Twitter as a platform cannot be described by its technical functionality. Reading a technical manual for Twitter would not help a user to become resident in that online space. As Andy Powell suggests this in his ‘Twitter for Idiots’ post, individuals have to experience the culture of the groups/communities/networks/flocks/whatever to really ‘get’ what the platform is all about. The perspectives we are currently using, to come to an understanding of the cultural/educational influence of digital technologies and the opportunities therein, need to be reconsidered. I’m not sure yet if the answer lies in post-digital or post-technical approaches but I’m looking forward to tending these ideas over the next few months and seeing if something beautiful grows.